i am constantly inspired by people who fight illness and still find energy to bring something positive and beautiful into the world. tracey is one of those people- a survivor of breast, liver and bone cancer, she decided to make caps for other patients and started selling them on etsy. 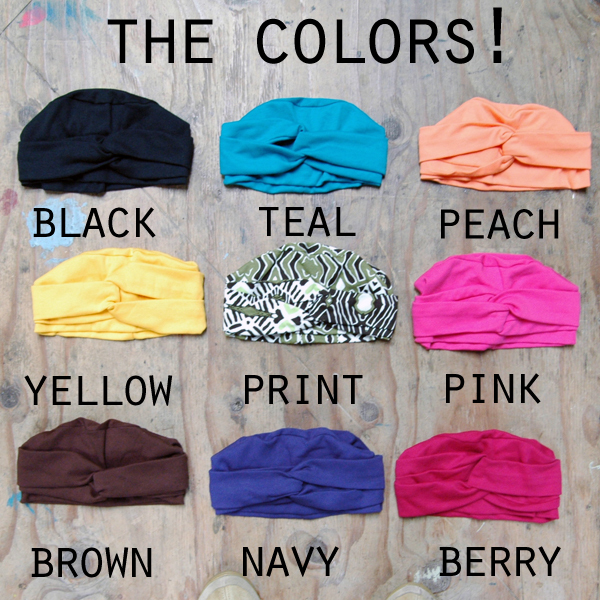 i was searching for turbans on one day and came across tracey’s shop, the pink scarab, stocked with turbans in every color and style! despite the fact that she was making them with cancer patients in mind, they were super stylish and easy to wear so i ordered a few for myself. i kept getting compliments on the hats and then got an email from tracey about the refinery29 article. she was really excited to see my workspace and read the blog and i was so flattered by her excitement. 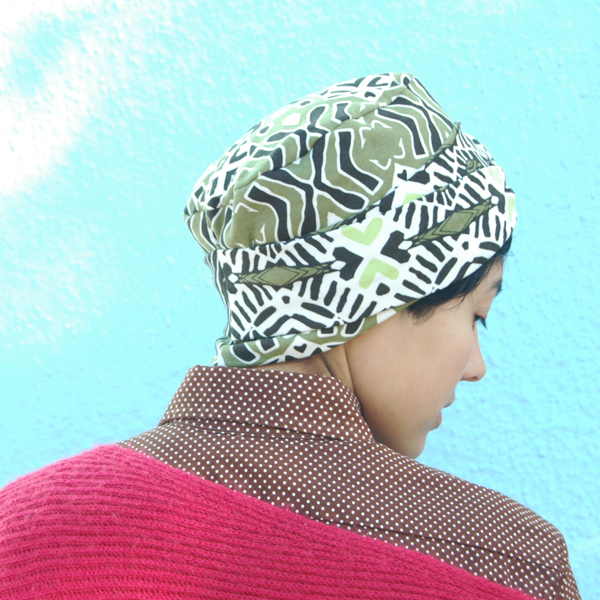 i thought it would be great to bring the turbans into the SHOP and show the more fashionable side of them- they’re made well, with love and they make any outftit look cool! tracey’s mentality is one i can get down with: if you look good, you feel good, which is an important part of life and an essential part of healing. 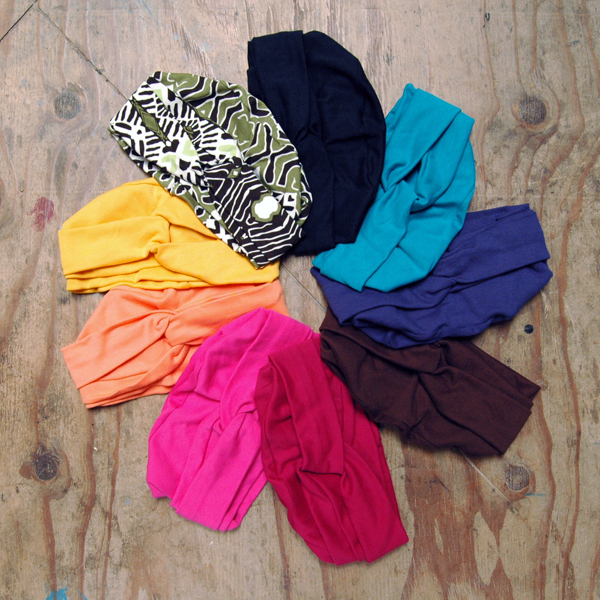 shop tracey’s twist turbans in the BIG THINGS SHOP or visit the pink scarab for other styles and colors. i am so grateful to tracey for making these special turbans for the SHOP and for inspiring us all to be creative and brave no matter what we’re faced with. How’d you get there? My husband’s job transfer. Where are you going? I am staying put! Who/what/where was the inspiration that lead you in this direction? In December 2006, I had my first breast cancer diagnosis. The chemotherapy put me into menopause. When I had hot flashes, I would pop off my wig or cap to cool off but chills would immediately followed, so I thought, “Wouldn’t it be nice to have a moisture wicking hat?” And I wondered if other women felt or experienced the same as I did. How are you feeling? Are you excited? Nervous? Terrified? Thrilled? I was very excited about the possibility of starting a hat business, using my sewing skills and business background. My family and friends thought I had a great idea too. The idea stayed with me through another move (5th one) in 2007 and another breast cancer diagnosis in 2008. When the dust settled, I really pushed to get the hat company up and running because I knew I would regret not trying. What kind of expectations do you have? To have my chemo caps in as many cancer centers as possible! The two cancer centers where I received treatments did not offer any. The gift shops had everything from tea cups to Christmas ornaments, but no caps! Are you scared of anything? My 11 year old daughter asks me this all the time, thinking my response will be spiders, snakes and ghosts, but I tell her that I am not afraid of anything since I’ve had cancer. What’s the worst thing that could happen? That the future is not what I had envisioned. What’s the best thing that could happen? My future is what I had envisioned for me, my husband and two daughters, plus my hats are in cancer centers! Tell us more about why you started your Etsy shop and what role art/craft/sewing has played in your life? I learned so much from my mother when I was growing up. I was always exposed to the arts and allowed to be creative with crafts and sewing. I had a little machine and lots of scraps to play with. I have always been fascinated with taking a square cloth and creating a garment from it. The Etsy shop was the perfect vehicle to test the waters to see how the caps would sell. The positive feedback and comments keep me motivated. And I have met many lovely people through the shop. It’s been a great experience. Besides selling your hats, are you involved in any breast cancer awareness programs or activism? I’ve met some wonderful women through the local Columbia, SC chapter of YSC, Young Survival Coalition. It is a supportive community of women that are in various stages of dealing with cancer. They are very inspirational. I absolutely loved being involved with The Lydia Project. We make tote bags filled with inspirational items that are given to women diagnosed with cancer. Their statement is to let women know they do not have to face cancer alone. Do you have any words of wisdom for those living with cancer or those with a close friend or family member who has been diagnosed? For family and friends who want to help, a simple note or card to let the patient know that you are thinking of them does wonders. Meals delivered during treatment week is always a welcomed gift and watching any children so patient can rest is a huge favor. Eating healthy and walk, walk, walk, even if you don’t feel like it. It does wonders for depression and helps raise the energy levels. Accept any help offered so that you can rest and recover. People love to help. I found it helped to look my best every day. Even when I only had 3 eyelashes, I still put on mascara! When you look good, you feel good and the compliments you receive really boost the spirits. This entry was posted on December 28, 2011 at 11:37 pm and is filed under BIG NEWS, BIG SHOP, BIG THINGS AHEAD, COLOR, SHOPPING. You can follow any responses to this entry through the RSS 2.0 feed.